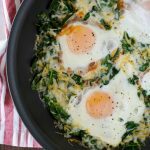 A healthy breakfast of Oven Baked Eggs with Spinach can be whipped up really quickly with this simple recipe! Hey guys! Hope your year is off to a great start! Apparently, mine is off to a slow start. This is my very first post of 2018. It took me a while to get out of holiday break mode and get back into the recipe developing process, but I’m back at it. 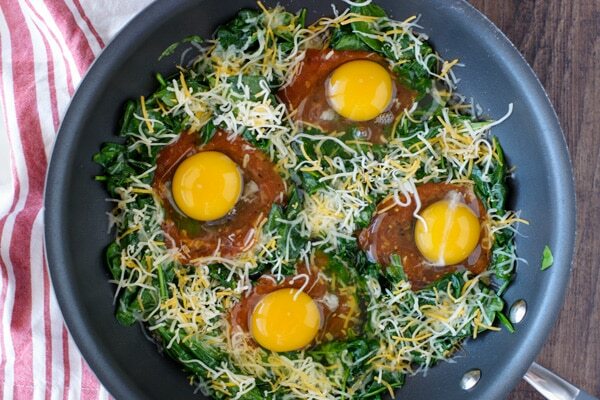 And these Oven Baked Eggs with Spinach will be on regular rotation this year for us. So easy to make and delicious! Not to mention the fact that these could be made Italian-style as well. I used a six-ounce bag of baby spinach because that’s what Trader Joe’s sells, but you can use up to a 10-ounce size bag. And you don’t have to go with Mexican flavors for this dish. You could substitute some leftover marinara or pizza sauce for the salsa, and use shredded mozzarella cheese instead. It’s totally up to you, which is one reason I like this dish so much. How long does it take to cook baked eggs? Cook times will vary depending on how done you want your eggs to be. If you prefer a runny yolk, it can be between 10-15 minutes. Remove the pan from the oven when the whites have set. A runny yolk will still wiggle when you shake the pan. Soft cooked and fully cooked eggs will take a bit longer. Start keeping a pretty close eye on it starting at around the 8-minute mark and take it out when it’s reached your desired doneness. 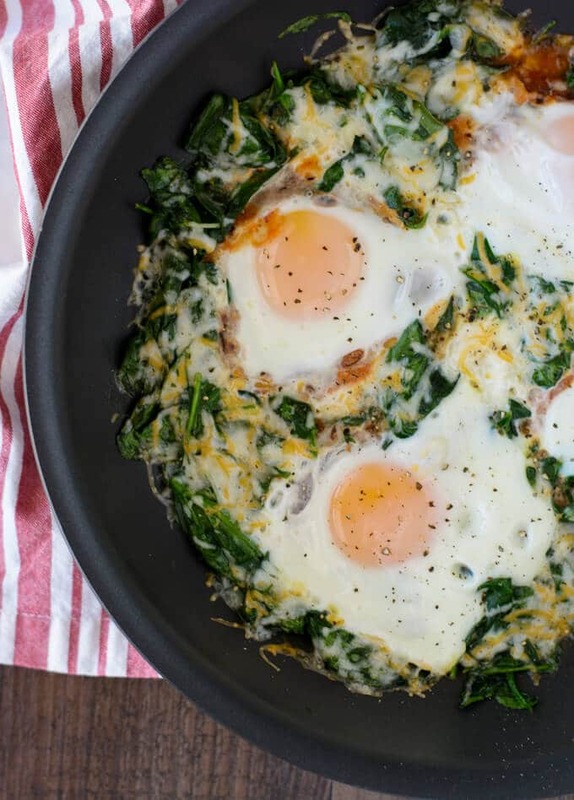 These Oven Baked Eggs with Spinach make a healthy and tasty breakfast or lunch option! Heat the oil over medium-high heat. Add as much spinach to the skillet as it will hold, and cook, turning frequently, adding a handful of additional spinach at a time until all of it is just wilted, 4-5 minutes. Make 4 indentations in the spinach. Spoon the salsa into the wells you have made. Crack one egg on the top of each serving of salsa. Be careful to make sure your yolks stay intact. Place skillet in the oven and let cook until egg whites have just set or until your desired doneness is reached. Keep a close eye on the oven beginning around the 8-minute mark.